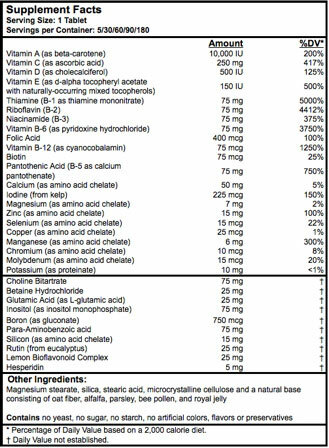 While many formulas look complete at a glance, most are lacking basic nutritional components. 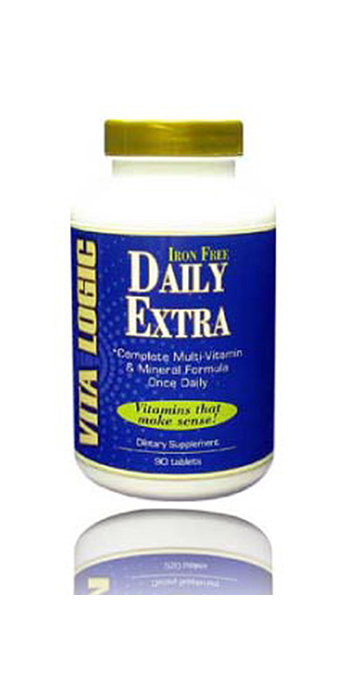 Daily Extra contains a comprehensive vitamin and mineral profile including ALL the B Vitamins. Every nutrient contained in Daily Extra is concentrated to therapeutic levels resulting in a truly complete, all natural, energy enhancing supplement. Daily Extra is guaranteed to be free of sugar, salt, starch, artificial coloring, flavors, coatings or preservatives and contains only natural sources of Vitamin E. In addition, Daily Extra is free of common allergens such as yeast, gluten, dairy, eggs, soy and wheat. As a dietary supplement, take one (1) tablet daily, or as directed by your healthcare professional.